It was an emotional night as Wakey Wheeled Cats celebrated another fantastic year with a winter ball. The night was a chance for us all to let our hair down after a busy year that has seen the Cats celebrate our fifth birthday, win two great home bouts and welcome some exciting new talent to the ranks. It was also a chance for us to reflect on our collective achievements, say thank you to those who have made the league prosper over the last 12 months and of course, indulge in a few snickers shots and bust some moves on the dance floor. The organisers of the night had a few surprises up their sleeves, as did we Cats, who set out on a secret mission to make WWC founder, captain and chair, Kirsty ‘Fu’ Quinn weep, as she prepares to step down in her role as chair and captain in the New Year. Fu, Bruise, Honey, Edd, Glory and Mike were responsible for planning the event and they did an amazing job. Balne Lane WMC was transformed into a hall worthy of Wakey’s finest, full of beautiful decorations, and complete with our own superstar DJ and National Portrait Gallery-featured photographer, Richie Stanley. Votes were cast and counted for the surprise awards – thank you to Ben and Rob for your help, and to Richard for presenting. The winners were, drumroll please…. Certificates of Thanks were given to the coaching team – Flo, Richie, Trubs, Acid, Coyote, Fu, Star, Zubat, Pulp, Glory, Brusin’, Honey and Ace; and to the committee team leaders – Rob, Richie, Flo, Acid, Honey, Mardy, Trubs, Bruise, Edd, Coyote, Dan and Ace. Huge congratulations must go to all the award winners, and those who were nominated. 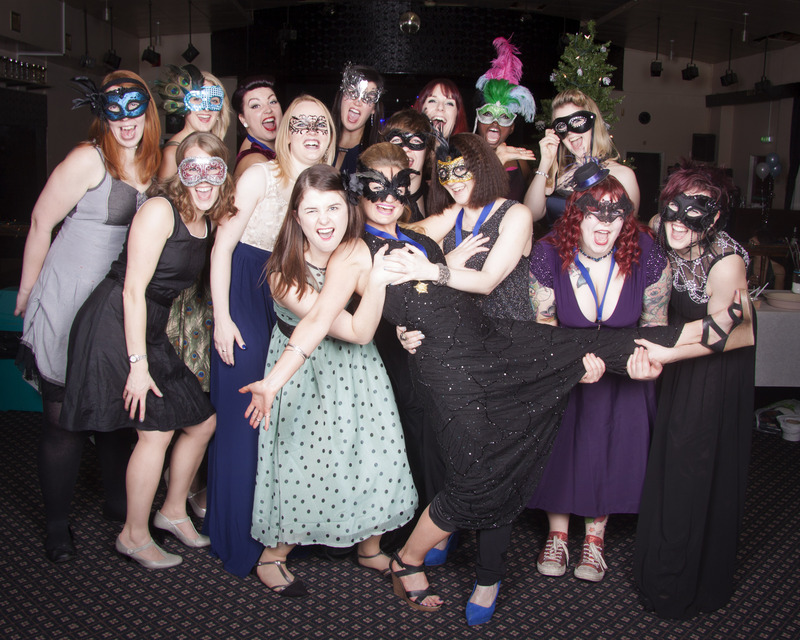 It was great to see so many of our newer league members at the ball, dressed to the nines. With so many skaters showing so much potential on track, who knows who will win the awards next year? As the entire team gathered for a group picture by The Portrait Sideshow at the end of the night, it was a real thrill to think of what we will achieve over the next five years. A final word from Fu: “The event was an end of year ‘thank you’ to, and recognition of, the members of the league who put in the extra hard work, from training and learning rules to running the league and organising committees. Fancy a peek at the cats looking all prim and proper? Click here to see the rest of the gallery courtesy of The Portrait Sideshow. Don’t we scrub up nice?